For many novices in the mechanical keyboard community, keyboard form factors and layouts are an area of confusion, and it makes buying the correct keyboard that much harder. In this post, I will discuss the differences between different form factors and layouts. Let’s start by laying the foundation for the terms so you know what I mean when I mention these words. This article largely applies to mechanical keyboards in particular. There are also other more niche form factors, but those are outside the scope of this article. Layouts affect the physical appearance of the key sizes and placements, as well as the total number of keys. If you’re not familiar with any of these terms, don’t worry, I will go over each and every one later on, so keep reading! The most recognizable mechanical keyboard form factor is the full size. Chances are, when you are asked to picture a keyboard, this is the form factor you will think of. The full size form factor has around 104 keys in total, depending on the layout. The main idea behind this form factor is that it leaves nothing out, which makes it a perfect candidate for those who don’t really know their preferences yet. You get dedicated access to everything a keyboard can offer, such as the arrow keys, function row and number pad. This form factor is a brilliant choice if you absolutely need a number pad (also known as the tenkeypad or numpad) and won’t consider a separate numpad for your late night online banking extravaganzas or your Excel work. Tenkeyless is the first step down the form factor ladder, tossing the ol’ numpad for some space on your desk. The TKL form factor has 88 or so keys in total, depending on the layout. 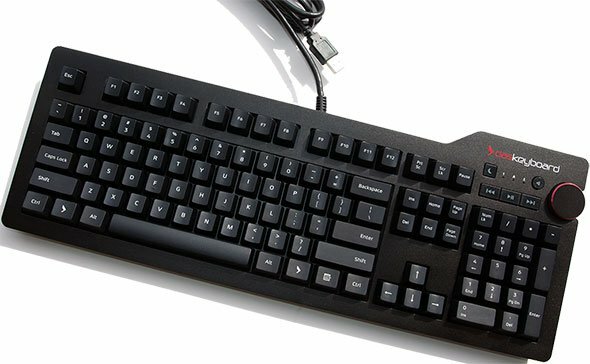 Highly popular in the PC-gaming community, the tenkeyless form factor is usually the optimal trade-off between form and function. Especially useful if you need a large amount of space to use your mouse, or have to deal with a smaller desk. If you play a competitive first person shooter game on a low mouse sensitivity, you’ll know what I’m getting at. The other advantage is that you can place the keyboard more ergonomically in front of you, rather than having to tuck it towards the left and type at an angle. 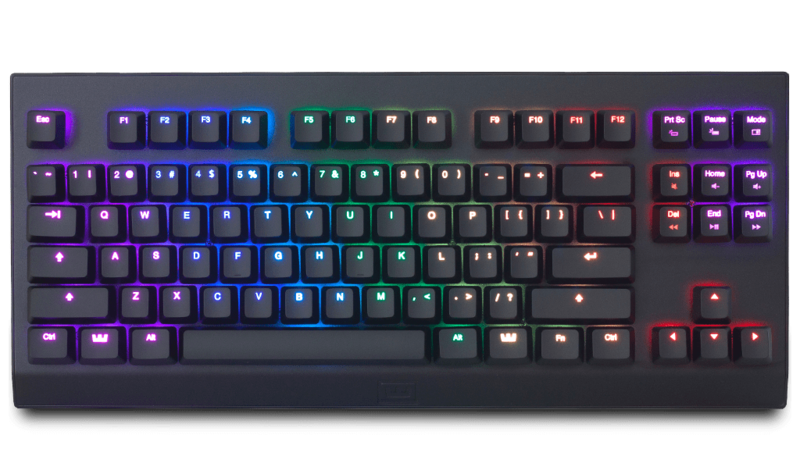 The Wooting One is a tenkeyless keyboard that’s perfect for gaming, with media keys placed in hand’s reach, which is not always the case. The 75% form factor is a bit smaller and cramped than the tenkeyless, but comes with more or less the same functionality. A very unpopular choice on the market, however very practical. The 75% form factor retains most of the functionality of a TKL, but crams the keys right next to each other, with no wasted space. If you have ever used a laptop keyboard, you should feel right at home with the 75% form factor. The most obvious disadvantage here is that finding keys in a large block with no spacing sometimes proves difficult. NOTE: Are you looking to buy a custom keycap set for your new mechanical keyboard? If so, I suggest getting the next size down or the previous size up, as the keycaps for this form factor are a nuisance to find. You can read more about keycap compatibility at the end. The Vortex Race 3 is an example of a 75% keyboard. The 60% form factor removes anything right of the Enter key, as well as the function row. These functions are usually accessible by holding FN and pressing other keys. 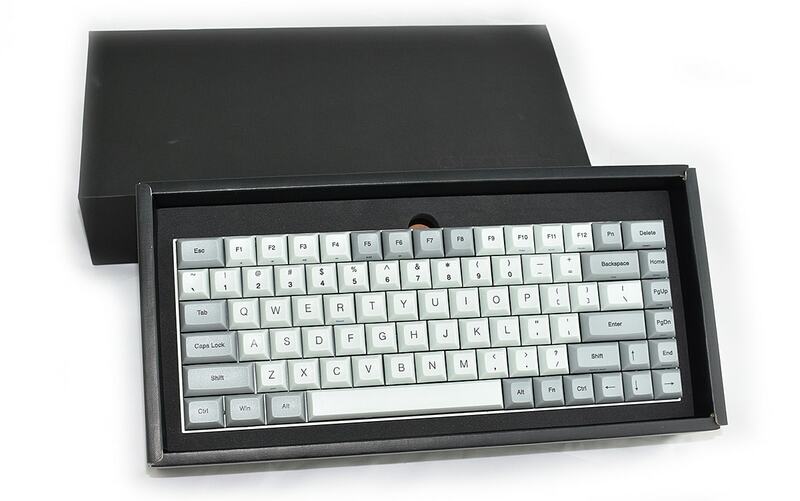 The 60% form factor has about 61 keys, depending on the layout. By opting for a 60% form factor keyboard, you enter the world of minimalism and aesthetics, rather than pragmatism and functionality. This form factor is fantastic if you are looking to customize your mechanical keyboard, or just take it on the go with you. The Vortex Pok3r is a common choice for a 60% keyboard. This is a form factor that doesn’t really belong with the rest of these more standard options, but I will include it for the sake of clarity. A gaming form factor is usually a proprietary form factor that incorporates macro- and media keys, and sometimes deviates from the ANSI or ISO standard, which I’ll explain in the next section. Most of the time however, they come closest to the full size form factor, but with added macro- and multimedia keys. 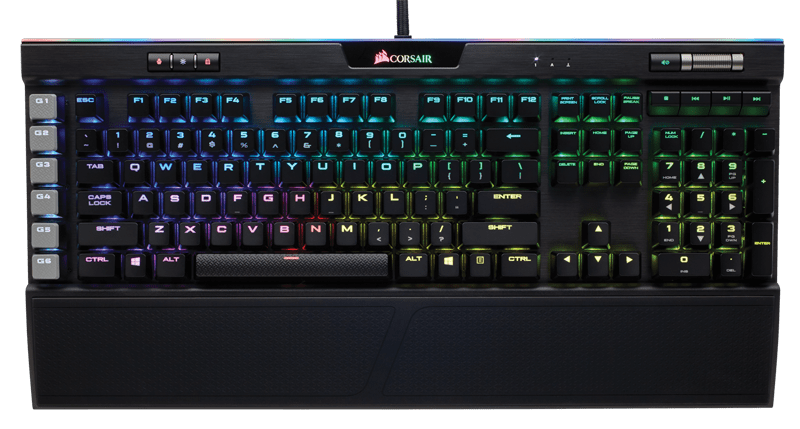 The Corsair K95 Platinum is a classical example of a gaming form factor. For more form factors, you can browse Reddit’s /r/mechanicalkeyboard gallery to get a taste of all the unconventional options out there. Form factor isn’t the only thing that affects the keyboard’s physical features. Depending on the country you live in, you might have different experiences about the key shapes or functionality. As pointed in the intro, the layout is the physical shape and size of the keys within a particular form factor. These layouts are going to cover 99% of layouts you will see on any mechanical keyboard. I have highlighted the differences in relation to each other to make them easier to spot. If you have only lived in one area of the world for your entire life, it’s probable that you have only ever seen one of these around. Usually, it’s ANSI for America, ISO for Europe, and JIS for Japan. It is essentially how the operating system decides what character to print on the screen when you press a key. However, you might see mechanical keyboards sold in different languages. All this means is that the keyboard comes pre-fitted with keycaps that match the language. An ISO Nordic keyboard is just an ISO layout keyboard, fitted with a Nordic keycap set. You can still set your language in the operating system to whatever you please. If you want to learn more about different language layouts, you can read about them in-depth on Wikipedia. The form factor is usually a non-issue. It decides how many keys your keyset needs to have to fit every switch. However, if you are using a 75% mechanical keyboard, which enjoys no universal standard of keycap sizing and/or placement, the chance of finding a fitting set is mostly limited to expensive custom runs or sets from the keyboard’s manufacturer. Next up is the layout. The ANSI standard layout is privileged to most options in the market. Whatever you have, make sure to match the set with the layout. ISO sets don’t fit entirely into ANSI layout keyboards, and vice versa. This is due to the different Enter and Shift key sizes, and the extra key ISO layout has. *The bottom row is sometimes non-standard, especially on gaming keyboards, and finding keycaps for a non-standard bottom row cuts down on your options. Here’s a quick image to tell whether your bottom row is standard or non-standard. Finally, if you need to look at the keys while you type, you will need to buy a set that matches the language you type in. This is the last chokepoint between the keycap set of your dreams and compatibility. If you’re used to typing on a Belgian keyboard, the different legends of a Nordic keycap set might throw you off. I hope you found this guide useful! In case you have more questions, or are unsure about something, leave a comment down below. Until next time! Previous Post ♪♫Jingle-caps, Jingle-caps, Wooting all the way. It’s December. Communications & PR @ Wooting. Mechanical keyboard aficionado and a tech lover. 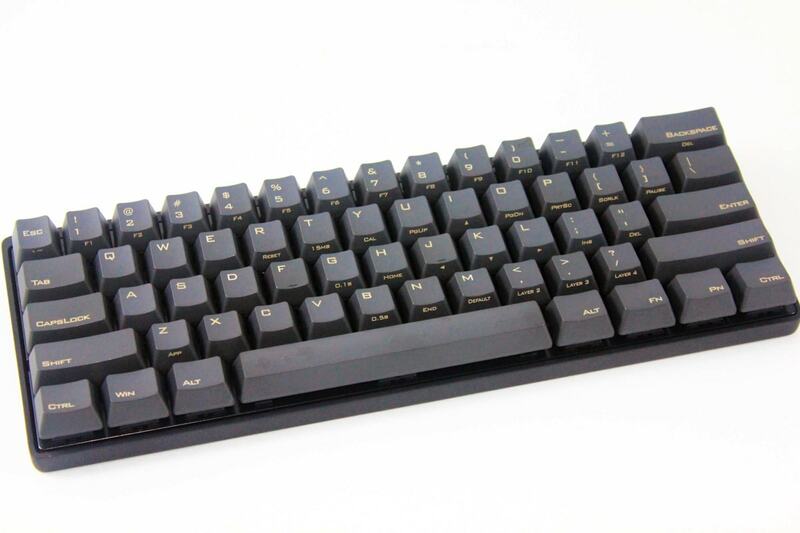 We will start selling AZERTY very soon. If you’re subscribed to the mailing list, you’ll be notified. Are you planning on making the Wooting One available in any other layouts and/or form factors? That’s one of the reasons that I can no longer use off the shelf keyboards- I’ve gotten to used to split backspace, split shift, split space, and the 65%/66% layout. The official word is “extremely low”. 75% is best (especially for a laptop), only the 2 pairs of PgUp/Dn and Ins/Del need to be swapped and Home/End put at very top horizontally. The last one like that I’ve seen (and owned) was Digital HiNote VP 7***/ Ultra 2000 (http://arvutimuuseum.ee/portables/img/033/003b.jpg). Unfortunately, tiny sized navigation keys placed in every other way, one more awkward than the other, or half of them missing, requiring an extra Fn key to press (like on MacBooks), became the industry standards. So, since my old HP laptop with such awkward tiny keys packed up (I never got to like them over near 10 years of usage), I gave up on laptops and got a desktop instead. P.S. and with the layout I mentioned you can make the Del key wider by shrinking the oversized “\” key to regular width. I really needed to know the physical sizes and dimensions of these keyboards even a range. Can’t seem to find it anywhere online. What is the length and height of a normal full sized key board, tenkeyless, or compact? Trying to see what the minimum dimensions of a laptop to order that I would be able to type comfortable on. I only have a phone right now to look at.